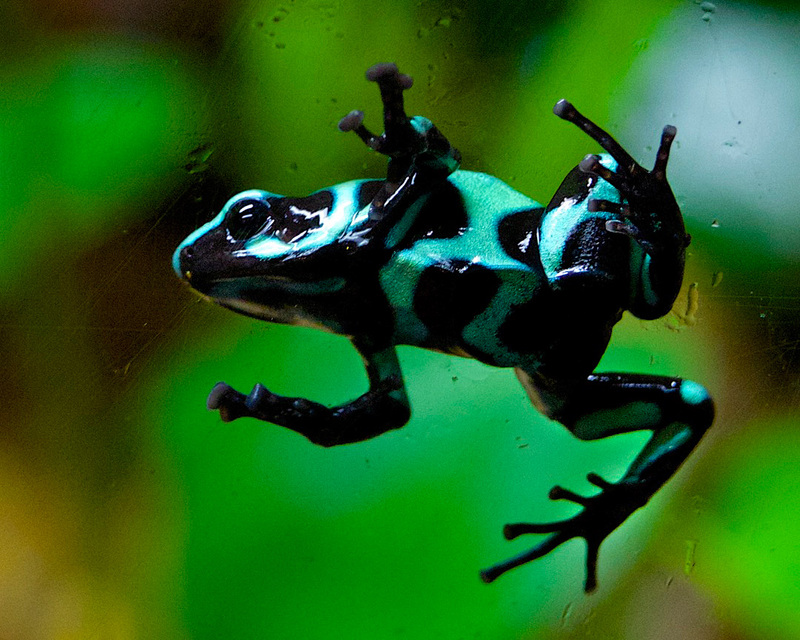 Poison dart frogs (also known as poison frogs and poison arrow frogs) are nearly all brightly colored. Their size varies from ½ to 2 inches long. Males are frequently smaller than the females. Male blue poison dart frogs have widened finger disc pads. These frogs are both terrestrial and partly arboreal, so they are found in leaf litter, trees and under logs and stones. Central and South America from Costa Rica to Brazil. Small insects and invertebrates, especially ants. Three to five years in the wild: up to ten years in captivity. Females lay eggs in moist plant material or in the water collected in a bromeliad. The male then fertilizes the eggs, which vary from 1 to 20, depending upon the species. A parent (usually the male) guards the eggs, which hatch in 8 to 14 days. The young tadpoles are then carried to a larger water hole where metamorphosis takes place in 5 to 15 weeks, depending upon the species. Due to their rainforest specialization, all of the more than 120 known species of poison dart frogs are threatened by habitat loss and environmental change. 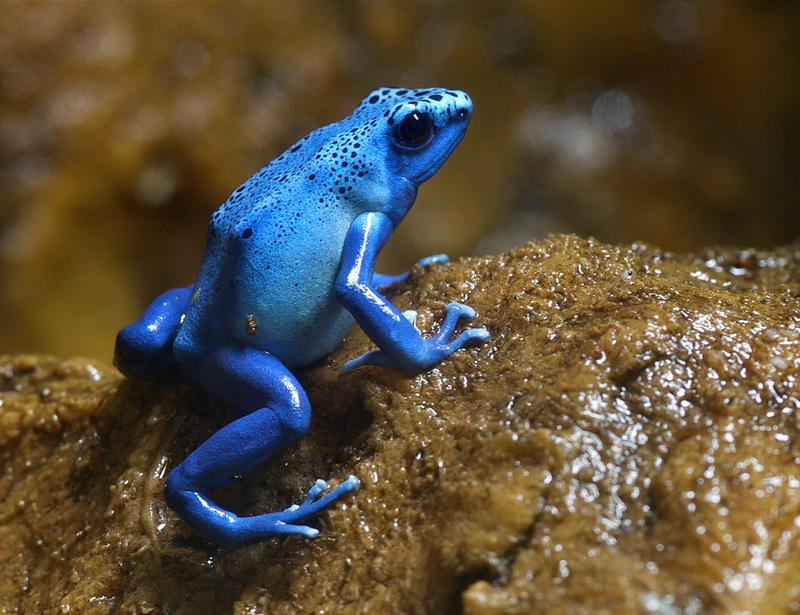 Blue poison dart frogs are specifically endangered due to overcollecting for the pet trade. Unlike most of the world’s roughly 4,500 species of frogs, poison dart frogs are diurnal or daytime-active amphibians. They inhabit rainforest habitats in Central and South America, where they prey on invertebrates, especially certain ant species, which enable the frogs to build up potent alkaloid poisons for defense. Poison frogs advertise their toxicity to potential predators with brilliant warning colors and patterns. This is known as aposematic or warning coloration and is also found among certain highly-toxic butterfly and snake species. Yellow and blue poison dart frog (also known as the dying poison dart frog) (Dendrobates tinctorius).